Everyone wants drag and drop page builders! It seems like every single week there’s another post about a drag and drop page builder. Some promise to be simple, while others promise high performance with a ton of features. It’s a dream everyone wants – and so it’s no surprise we’re even seeing front-end drag and drop page builders appear. And whether it’s front-end or back-end driven, you can bet comments will come in from people who are enjoying the massively successful Visual Composer. You might think I’ll tell you that the dirty little secret is the fact that putting a powerful tool in the hands of a non-designer will only make more ugly websites that look out of control. You’ll think I will compare it to 14 year old guys who use Axe body spray instead of a shower, thinking it will make everything better. But no, that’s not the thing we don’t talk about. We talk about that all the time. Sometimes giving people powerful tools only makes things worse. But I’ve already said that. No, it’s something else. Something not as glaring. Take a look at this shot. It’s a nifty page created by Visual Composer. Only, it’s taken after the plugin is deactivated. I want you to dream about your site. You know, the one where you use Visual Composer. And then I want you to imagine that you decide to update your theme to a custom solution that doesn’t require (or support) Visual Composer. Guess what you’ll see when you deactivate your plugin? Yup – you guessed it. Shortcode Hell. That’s a technical term, in case you didn’t know. It’s the way I classify a website with pages that require you to go to each and every single one to edit them so that all those short codes get taken out. How much time do you think that will take? The result is that you end up feeling locked in because a change feels overwhelming. Isn’t it time to walk away from that kind of vendor lock-in? There is, in fact, one drag and drop page builder I trust and like. It’s the one coded by WordPress core contributor Mark Jaquith, called VelocityPage. You don’t need me to tell you that they approach things differently, do you? I mean, you could guess that the team there would think about this kind of stuff, to make sure you’re not left in shortcode hell. Right? Well, take a look at what happens when you deactivate VelocityPage. If you’re like me, you noticed right away that there are no shortcodes. But did you also notice that the titles are styled – not because we hard-coded things, but because they come styled as H2s and my theme knows how to treat those automatically. I don’t know if you caught it, but the folks at VelocityPage announced several templates for landing pages. It’s pretty sweet, because they look good but also give you direct access to tweak parts of the pages to make them match what we want to do. So if you haven’t checked this front-end page builder yet – even though it’s a lot simpler than Visual Composer – don’t wait any longer. VelocityPage takes into account performance, security, and plugin lock-in – making sure that you can use it for as long as you need without any negative consequence of leaving it behind. 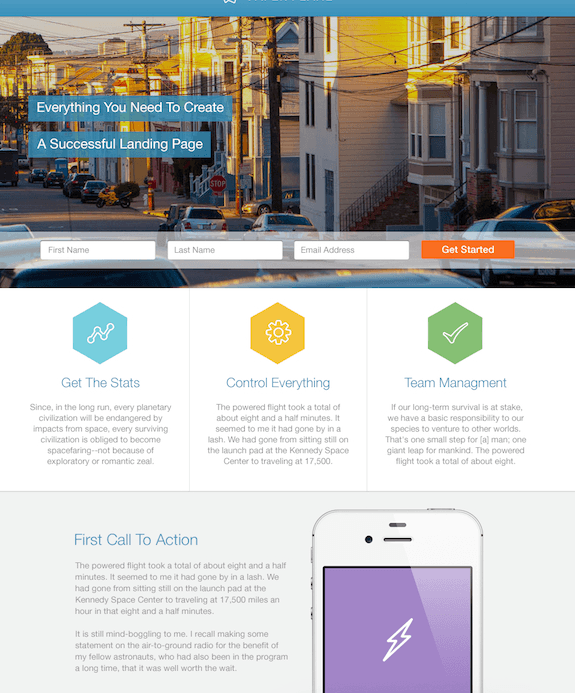 And now with landing page templates, it’s a no brainer to help you do things easily while still looking good.